As I discussed yesterday, I found a few awesome recipes to start the year off on a sweet note! And those Apple Brownies were a HUGE hit at last night’s dinner (even if they were undercooked)! This recipe was originally made with blueberry jam, but I decided to sub in this Cinnamon Candy Apple Butter from Door County. It’s helpful to have a food processor to help blend together the butter into the cookie crust. I do wish that I had more apple butter for the bars…it definitely could have used a thicker layer! These bars baked up beautifully! Luckily, my little kitchen helper (who is not so helpful) snoozed most of the afternoon and stayed out of the kitchen. These bars have so much potential and so many options, so check out your fridge to see what jam you have available. Or make your own homemade with the end of summer bounty! My favorite is this Naked Apple Butter! 3/4 cup any flavor preserve *Use MORE! Preheat the oven to 350 degrees . Line a 9-inch square baking pan with a 12-inch-long sheet of foil or spray with cooking spray. Using a food processor, mix the flour, almonds, sugar, baking soda and salt until the nuts are finely ground. Add the butter and pulse until coarse crumbs form. Beat together the egg and vanilla; drizzle over the dough mixture. 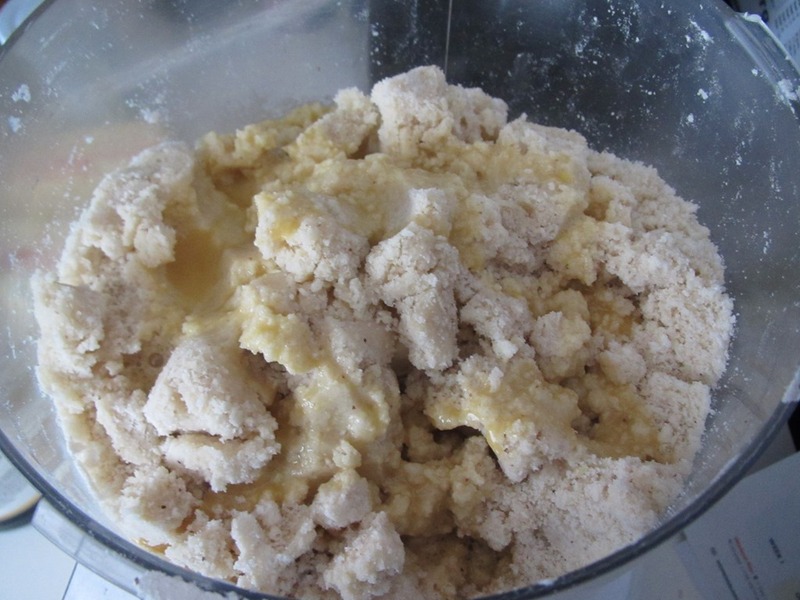 Transfer the mixture to a large bowl and knead with your fingertips until clumpy. Transfer two-thirds of the dough to the pan and press into the bottom to form an even layer. Spread the preserves on top. Dot the top with the remaining dough in clumps. Bake until the edges are lightly golden, 35 to 40 minutes. Let cool completely. Turn out of the pan, remove the foil and cut into squares. That looks SO good. But, even better is that picture of little Cooper! SO CUTE! Thanks for sharing all these recipes, but I may be sending you a bill for the seamstress when I have to let my pants out! Oh my gosh, these sound so good! Fruit desserts are my favorite. So cute! I take soo many pictures of him! But his favorite spot is on the counter (or in the sink) which is tough when I’m baking. Hope you get to make the bars. They are SOO good! OMG cinnamon apple candy butter? I really hope I can find this stuff…it sounds magical! I’m sure somewhere on line or you could always try and make your own. It’s apple and crockpot season! I think that’s what makes these soo fun is that most of the ingredients are pantry staples and then you can use a seasonal jelly or jam. Enjoy!! !